A peace agreement is being discussed between the Revolutionary Armed Forces of Colombia (FARC) and the Colombian government. Once signed, Reyes recommended the government implement structural reforms in rural zones, recalling that the land conflicts were at the root of the prolonged internal conflict. Concretely, the government should create a modern, all-purpose land register that will allow the recovery and redistribution of barren lands, as well as the implementation of equitable and environmental-friendly policies. According to the most recent official record, in the Colombian countryside 0.4% of the population owns 44% of the land. The big land owners of the country fear that, for the first time in history, they could be compelled to disclose the commercial value of their lands, pay taxes and grant rights to their rural farmworkers, the researcher said. The FARC have been negotiating with the government since 2012 for meaningful rural reforms. 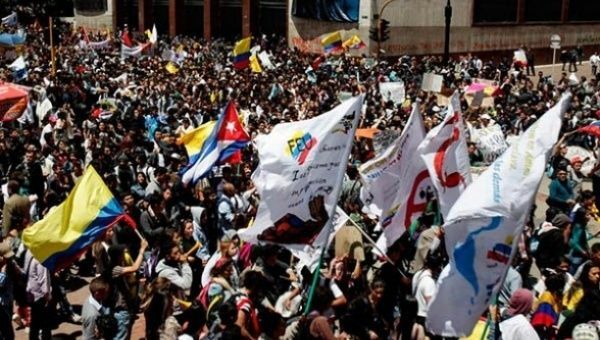 On August 30, campesinos initiated a huge mobilisation across the country, saying the government had not fulfilled promises made after general strikes last over the past two years. Instead, it signed free trade agreements that went against the campesinos’ interests.